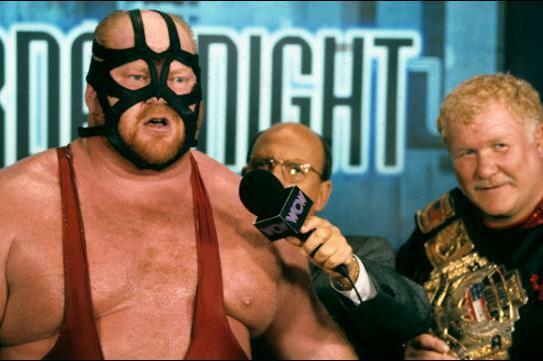 John Pollock examines the career and life of the late Leon 'Vader' White with exclusive comments from Jim Ross and Bret Hart, reflecting on one of the greatest 'big men' in the history of professional wrestling. The professional wrestling world has lost one of the most athletic big men in the history of the industry with the passing of Leon ‘Vader’ White. White had been struggling with heart problems for several years and underwent open heart surgeries this past March and May. He was recently diagnosed with pneumonia and died on Monday evening at the age of 63. As a football player, White played for the University of Colorado and became a third-round draft pick by the L.A. Rams in 1978. An injury thwarted White’s playing days and sent him down the path of professional wrestling through the training of Brad Rheingans. It was there that a connection was made with Verne Gagne’s AWA where White debuted as the Baby Bull and later, Bull Power. It wasn’t long before White saw success on the international stage, a platform that he would excel on throughout his career. He ventured overseas working for Otto Wanz and the Catch Wrestling Association, where he became the promotion’s world champion in March 1987 by defeating Wanz. He held the title on two more occasions with the final championship run lasting from December 1990 until July 1991. In 1987, he caught the attention of New Japan Pro Wrestling, who had plans for a massive introduction for him. The idea of the “Big Van Vader” character was initially designed for Jim Hellwig, but after Hellwig made the decision to join the World Wrestling Federation, the lucrative Big Van Vader prototype was left up for grabs and White was bestowed the moniker. It’s hard to emphasize how valuable they saw this character, opting to introduce Vader on the promotion’s final card of 1987 at Sumo Hall. It was here that Vader pinned Antonio Inoki in three minutes, causing a legitimate riot to break out and New Japan being banned from Sumo Hall as a result. A clean loss was a rarity for Inoki, who was often protected with a draw, count out or disqualification. The result was emphatic and designed to create a megastar in Vader on his first night. Vader would become the first U.S. born IWGP heavyweight champion, winning a one-night tournament at the first wrestling card at the Tokyo Dome on April 24th, 1989. On that night, Vader defeated Masahiro Chono, Tatsumi Fujinami, and Shinya Hashimoto to become the third man to hold the IWGP championship. He held the title on three occasions before his U.S. commitments began taking further priority. In WCW, though Vader became the promotion’s top heel when business was down, his matches with the likes of Ric Flair, Cactus Jack, Dustin Rhodes, and Sting were highlights of the era. He was paired with Harley Race as his manager, an underrated pairing with the legendary tough guy in Race, a former NWA champion, and his athletic monster running roughshod on the top babyfaces. Vader became WCW champion in July 1992 defeating Sting at the Great American Bash but only held the championship briefly before losing it to Ron Simmons. The title change to Simmons was the first major move made by Bill Watts, who had come into power earlier that spring. Vader unseated Simmons as champion before the end of 1992 and flipped the title with Sting in March 1993. Vader’s final WCW title loss came in December 1993 in one of WCW’s most famous matches. Starrcade was scheduled to feature Vader defending the title against Sid Vicious in Charlotte, North Carolina. During an overseas incident that was heavily covered, Vicious and Arn Anderson got into a dangerous hotel brawl involving scissors, leading to Vicious stabbing Anderson and the promotion being forced to cut ties with him. The Starrcade main event was out the window and Ric Flair was brought in as the backup, going for one more title reign in his hometown and putting his career on the line. It was a dramatic match that culminated in Flair stopping Vader and regaining the championship. One of the more discussed programs of this era was Vader’s feud with Cactus Jack that featured a stunning powerbomb on ‘Saturday Night’ executed by Vader to Jack on the concrete floor. Though the angle deteriorated as Jack came down with amnesia, questionable creative never diminished from the in-ring quality of their matches. As 1994 progressed, the major news for WCW that year was the signing of Hulk Hogan, who immediately became WCW champion in July, significantly changing the culture of the company. It was a natural feud pitting Hogan against Vader, an archetype that the WWF patterned throughout the 80’s with Hogan facing the giant villain. The feud was hardly a success. They had three pay-per-view matches in 1995 with puzzling finishes, face-saving measures taken for Hogan’s protection, or both. Vader would not last with the company through the end of the year, leaving shortly after the summer with his sights set on WCW’s chief rival. White was signed by the World Wrestling Federation and debuted at the 1996 Royal Rumble. The following night featured a major angle with Vader attacking WWF on-screen president Gorilla Monsoon, who never did physical angles at this stage of his career. It was a big introduction for Vader, who was pegged at one time to defeat Shawn Michaels for the WWF championship. Vader was eventually passed on and it was Sid Vicious who would get a brief run with the championship before the end of 1996. It was also during this time that Vader’s size became more of a detriment than an asset to his performance. It became a concern when Vader and fellow locker room member Yokozuna (Rodney Anoi’a) were putting on so much weight that it threatened their ability to be licensed in states that still regulated professional wrestling, causing a ripple effect with other commissioned states following suit. Vader left the World Wrestling Federation in 1998; a low point of his career. Following an unsatisfying run with the company, he looked abroad to rehabilitate his image and passion for the industry, receiving an offer from All Japan Pro Wrestling where he awoke the naysayers and had one of his greatest runs. With a renewed sense of motivation, White returned to old form. All Japan acknowledged this by awarding Vader his first Triple Crown in March 1999 by defeating Akira Taue after the championship was vacated by an injured Toshiaki Kawada. Vader dropped the title to Mitsuharu Misawa in the main event of the Giant Baba Memorial card at the Tokyo Dome in May 1999 and regained it in October, dropping it a final time to Kenta Kobashi in February 2000. Vader would then accompany the procession of talent led by Misawa that exited All Japan in the spring of 2000 to form Pro Wrestling NOAH. In the years that followed, Vader made sporadic appearances across the world for a variety of promotions. He returned to the WWE for an ill-fated segment in October 2005 as a surprise enforcer for Jonathan Coachman in a segment infamously remembered for Vader’s slip on the ramp towards the ring. He returned in 2012 for a pair of appearances against Heath Slater, including a cameo on Raw 1000 in July 2012. He also inducted Stan Hansen into the WWE Hall of Fame in 2016 in Dallas. In 2016, he received a lot of attention for his criticism of a Best of the Super Juniors match between Will Ospreay and Ricochet. It led to a match between Ospreay and Vader for Revolution Pro in August 2016. Vader won the match, with Ospreay later stating that the finish was changed the night prior because Vader was unwilling to lose. White was riddled with heart-related health issues over the past year, including two open heart surgeries being performed on him in March and May of 2018. Leon White will be remembered as one of the greatest big men in the history of the industry, who found success in multiple styles and promotions, with a memorable character that he took to great heights. POST Wrestling is working on an audio feature on Leon White that will debut in the near future.